Vegetarians are those people who do not eat meat while non vegetarians are those who include meat in their diets. The following essay will explain the benefits of being a non vegetarian over a vegetarian. The first aspect to consider is the issue of nutrition. Eating meat comes with numerous health benefits that cannot be derived from any vegetarian meal. To start with, meat contains high quality proteins with all the essential amino acids. Proteins are very useful in body building and thus persons relying only on plant foods for proteins are more vulnerable to retarded growth and a weak body than a non vegetarian. A well cooked chicken provides amino acids that protects from common influenza and enhances a person's immune system against common ailments and allergies. Meat contains creatinine which is necessary for building the body muscle mass for locomotion and other physical practices. Most vegetarian infants exhibit stunted growth (Brown, 2008). Iron which is a crucial mineral in hemoglobin formation and the consequent blood level sustenance especially for menstruating women is present in huge quantities in red meat than from any plant source. Animal liver for instance, contains 6000 mcgm per every 100 grams as opposed to 325 mcgm per every 100 grams of carrots. Bone marrow and soup is also a very rich source of iron as compared to green vegetables. Vegetarians are more likely to suffer from iron-deficiency anemia due to a low iron level. The phosphorus content found in cereals and legumes is normally in the form of phytic acid. This means this kind of phosphorus has to be hydrolyzed first before it can be absorbed into the body. On the contrary, the phosphorus found in meats is easily absorbed in body tissues indicating that non vegetarians are more likely to have the desirable levels of phosphorus in the body than vegetarians. Meat also contains high levels of vitamin B12 which is absent in plant foods. Deficiency of vitamin B12 may lead to Macrocytic Anemia in infants of vegetarian mothers. Strict vegetarians face the risk of nutritional deficiencies such as riboflavin, zinc, iron, calcium and essential amino acids like lysine and methionine. Vegetarian children face the risk of energy deficiency in calories (Brown, 2008). Fish, milk and milk products are very rich in calcium which is important for ensuring strong bones and teeth. Children lacking meat in their diets normally have problems in teeth formation and their bones are weak often resulting to frequent fractures and limb deformations and rickets due to lack of vitamin D. The calcium quantities in plant foods are minute and unreliable when it comes to proper bone and teeth formation. Osteoporosis may result due to calcium deficiency and cause bone demineralization . Some fish types such as tuna and salmon contains omega 3 acids which are very useful in mental health and general physical health. Omega 3 acids also have good anti-cancer properties. Fish also contains vitamin A well known for its ability to boost human memory and thus intelligence. Children fed with fish supplements are found to perform better academically than those who depend entirely on plants for their food. The nutrients concentration in meat is high as compared to that in plant foods and hence little quantity of food is required in non vegetarian diets than in the vegetarian ones. This has the advantage of reducing the cases of food shortages if all people would adopt the concept of having meat as part of their diets and the resultant savings on food would be channeled to other financial needs. The good thing with non vegetarians is that they consume both plant foods as well as meat thus it is easier for them to attain a balanced diet than those who cannot eat meat. Patients who eat meat are found to recover more quickly than those who don't since meat helps to speed up the repair of damaged body cells and formation of new cells. In the west Vegetarians face a higher rate of lack of food choices since restaurants still do not provide a wide range of vegetarian foods and preparing the food separately may be time consuming and expensive. Also a person is more likely to miss vegetarian food options when they drop at a friend's house for dinner. On the contrary, a non vegetarian cannot suffer such food option limitations since they can feast on both plant foods as well as meat. Outside India ,Vegetarians will have more hard times eating out with friends since it is much easier to arrange meals for everyone in the group rather than making separate meals for people who don't eat meat. A non vegetarian will find it uncomfortable to eat from the same table with people eating meat which is not the case with a non vegetarian who can eat any kind of food on the table (Brown, 2008). Ecological issue is another aspect to consider when thinking of the benefits of being a non vegetarian. Man makes part of the ecological food web that is responsible for balancing the natural occurrence of living things; animals and plants. If all people were to stop eating meat from animals, the population of herbivores would drastically increase resulting to lack of pasture and fodder for the domestic animals due to over competition. This would in turn result to starvation of the livestock and their eventual death. This explains the essence of man having to include animal meat in their diet to maintain a balance on the number of herbivores feeding on plants at any given time. Animal products such as skins, hides, fur and bones are useful in production of leather items, clothing and adhesives. This implies that having meat as part of the human diet comes with other benefits of the by products. It is ironic that people are against non vegetarian practices yet they are quick to use leather products obtained after these animals are slaughtered. Most of the religious beliefs that make people not to eat meat are based on the belief of reincarnation. Most Asian religious groups that do not eat meat believe that when a person dies, they reincarnate in form of an animal. This makes them believe that eating meat would mean eating their ancestors or those who have just died. The truth about this belief is very questionable since their mythical theory cannot explain why the animal population is still low in comparison to the number of people who have died. Animals are born and develop just like humans do and never do they emerge from reincarnation as alleged. In a biblical point of view, God created man and gave them dominion over all animals. He did bless the animals for human consumption and hence eating meat should not be considered as sin. The Quran also allows its followers to have meat as part of their food. Animals cannot be fully personified to possess "human rights" of not being killed for human consumptions. Owing to the above benefits associated with eating meat, it is therefore more logical and beneficial for all people to become non vegetarians, and assume the full benefits that come with the consumption of meat. Last edited by carnivore; June 28th, 2010 at 02:41 AM. what do you say about cannibalism? why? its same as non-vegitarianism. flesh is flesh, kutte-billi ka khao ya sher bakri ka khao. Certainly not..........you should not eat your own kind. We humans have created civilization and cannot be treated on par with animals. Humans are superior to animals......there are no ifs and buts about it. Since when was photo film made out of hooves and calves?? Either your picture is incorrect or incredibly out of date to an extent that the concept would be misinterpreted. Animals, unlike plants, have nervous systems. This means that they can feel pain. So why don't we turn the facts around for a moment. How would you feel if a chicken had us for dinner? Although our lives are not at risk from that kind of situation, do you not understand that animals, so many poor animals, are killed at adulthood and do not get to experience their full life? They do not get to see their full life because of non-vegetarians out there, who can't take appropriate action against murder, ruthless killing, that is sought to achieve a particular taste in our mouths and create an appearance on our dinner plate. This brutal annihilation is followed by consumption of the body with hardly any sign of distraught on the consumer's face. Why, you ask, is the correct treatment of these animals prevented? It is because of non-vegetarianism, of animal slaughter and also because of misunderstanding. So back to the topic, why should you be vegetarian? Refraining from meat and non-vegetarianism is a step closer to animal rights, providing a greater understanding of the animals around us. 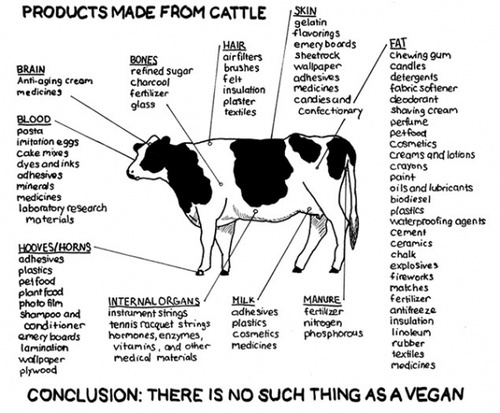 If you think that many things nowadays are made out of animal flesh, you are wrong. Modern furniture and technology are using meat-free alternatives to their design, in order to achieve a more vegetarian standard of production and also because modern synthetic materials can have more options for customer satisfaction. If murdering innocent animals is not considered as a sin then what is considered as a sin? And there are vegetarian alternatives to eating carcass, probably something you should have researched before you wrote your article. Calcium is mainly found in dairy products, so I do not see the risk of vegetarians facing calcium deficiency. Last edited by cheese123; July 25th, 2013 at 04:36 PM. The majority of people become vegetarian because they believe it is wrong to kill animals for food, and because they are opposed to the cruelty and pain inflicted upon the billions of farmed animals. In the UK alone, over two million land animals are slaughtered each day, and almost 600,000 tonnes of fish each year, just so that people can eat their flesh or wear their skin. The process of getting a piece of ‘meat’ onto an individual’s dinner plate is the result of much stress and suffering for any animal. A lot of people find it particularly upsetting to view images, or even to read about, the average life experience of a farmed animal. A vegetarian diet is more sustainable and can be much better for your own health, but for many people, going vegetarian is all about the animals. Millions of people around the world believe it is wrong for animals to suffer and die, just so they can be turned into food. The UK is said to be a nation of animal lovers, but more than two million land animals are killed here every day just to satisfy the population’s taste for meat. Cats, dogs, rabbits and other pets share our lives and our homes, while cattle, pigs, sheep and other farm animals are seen as disposable commodities. Is that something you feel comfortable with? It is clear that animal cruelty is a big cause for people to turn to vegetarianism. So why don't you take a step forward to justice and become vegetarian? After all, what else can be done to stop this horrendously cruel act? Research shows that eating a well-balanced, low-fat and high-fibre vegetarian diet may reduce the chances of suffering from certain cancers (eg colon cancer), heart disease, diabetes and obesity. Vegetarian diets have also been used in the treatment of various illnesses, including rheumatoid arthritis and Type 2 diabetes. More recent research has indicated that vegetarians appear more ‘health conscious’ than non-vegetarians. Last edited by cheese123; July 27th, 2013 at 01:17 AM.